Children's Grand Park in Seoul, Korea was established on Children's Day in 1973 and has served as a public park with a botanical garden, a zoo, and an amusement theme park. 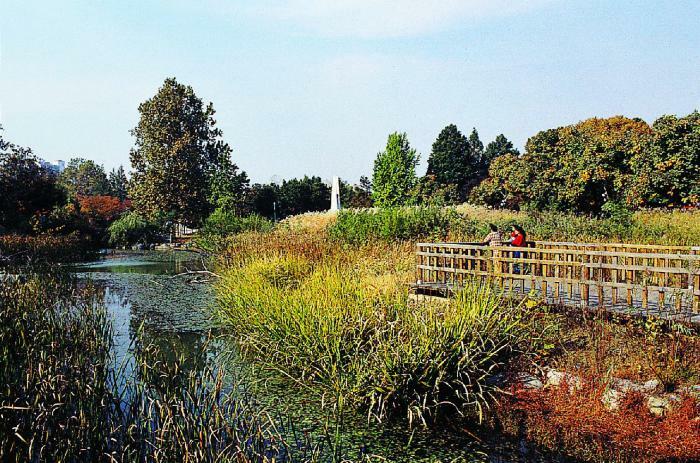 With the lack of a systematic maintenance program and heavy usage, it suffered from an unhealthy environment: the pond near the main entrance was contaminated, the trees were dying, and the park itself was isolated from the surrounding nature of Seoul. The 21st Century Eco-park Project was created to transform the park into an ecologically healthy and technologically advanced one. The park was redesigned to teach children about nature. The Children's Grand Park, Seoul, was created as a part of the Planting 10-million Trees of Life (also called Trees of Life Campaign) project. The project was organized by both city and administrative districts of Seoul to achieve six goals: greening neighborhoods, preserving and creating an urban greenbelt, reforesting barren lands and edges of natural parks, enhancing citizen participation, promoting a green maintenance system, and establishing a Green policy. Forty-seven urban outdoor spaces, which include urban parks, ecological parks, pedestrian walkways, gardens, pocket parks, public plazas, and roof gardens were introduced. Park address: 18 Neung-dong, Gwangjin-gu, Seoul, South Korea. Developer: Seoan, Co.
Keywords: Little Angel's Center, Center for Children, observation deck, educational board. Contributed by Eui-je Lim, PhD. Seoul Metropolitan Government (2002). Ten Million Trees: Making a Livable City, Seoul: Seoul Metropolitan Government.